Whether you’re a seasoned equestrian or have never set eyes on a horse, Loudoun County is the perfect place to experience horse country. Loudoun is known for its horse culture, as seen in the Middleburg hunt club, international competitions, and our countless horse trails through the rolling hills. Middleburg alone has always been a must visit for horse enthusiasts, including the Kennedy family. To start off your horse country adventure, you may need to buy your supplies. Want to look the part? Head over to Journeymen Saddlers where you can pick out the perfect outfit and find some equestrian gift items. Even if you’re not planning on riding, you can still enhance your equestrian experience. If you need a new saddle or accessories for your horse, you can go to Another Turn Tack in Purcellville to find one that’s just right. The store has boots, blankets, helmets, and anything else you might need. Start your day off in a balanced state of mind by doing some yoga in the horse stables at Salamander Resort & Spa. If you are brave enough, go a step farther and do yoga on a horse! This will leave you feeling warmed up for a day of riding or just walking around town. The stables at Salamander offer a wide variety of services, including different scenic trail rides through Middleburg’s countryside. If you would prefer to work on skills, take a class, ranging from beginner level to more advanced riding. You may be a little sore after your ride, so book the Rider’s Relief massage at the resort’s spa to relax and ease the specific muscles you use while riding. There are many equestrian-rooted places to stay in Loudoun, perfect for a weekend getaway. The Red Fox Inn & Tavern is one of America’s oldest continuously run inns. Its name is inspired by the legendary fox hunting in Middleburg, dating back to the 1800’s. It is also within walking distance of equestrian shops and attractions in the center of town. For a more relaxed country feel, the Goodstone Inn is perfect for you. Set on a working farm, this picturesque location is in the heart of horse country, and is close to all the equestrian activities and events in Loudoun. 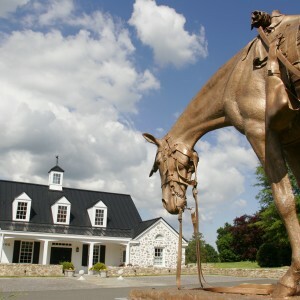 Keeping up with the horse theme, Loudoun is home to fantastic restaurants with equestrian vibes. Hunter&apos;s Head Tavern is in the small town of Upperville, and feels like an English country pub. You can sit inside on a cold day and enjoy the stone fireplaces, or enjoy the country atmosphere outside on the terrace. Their locally sourced pub food will fill you up after a long day of riding. If you need a mid-day jolt of caffeine, stop by Cuppa Giddy Up where you can find coffee, pastries, and smoothies. For a more upscale experience, there is Palio Ristorante Italiano in old town Leesburg. Named after the famous Italian horse race, you can enjoy authentic Italian food surrounded by beautiful equestrian art. If you want to learn some more about the equestrian history of Loudoun, there is plenty to see. Morven Park is a historic Virginia Governor’s home. It contains the Museum of Hounds & Hunting and the Winmill Carriage Museum. The house is filled with foxhunting artifacts, and was previously used as an international equestrian institute. The outdoor facilities are still in use today for fox hunts, trail rides, and dressage competitions. There’s also the National Sporting Library & Museum, which has beautiful collections of horse inspired paintings and sculptures. The library has thousands of historical and rare book collections about horses. They also host monthly events and exhibits featuring local food and wineries! Check out our list of horse events coming up! There are events every season, so you always have the perfect excuse for a weekend getaway. Let us know what your favorite equestrian activities are in Loudoun!